Originally established in the fertile farmlands surrounding the seaside resorts of Youghal, Co. Cork in Ireland, over the years Fantastic Flavours Ice Cream Parlour has gained a reputation for creating delicious, award-winning and unique delicacies. Today, its Founders, Miceál O’Hurley and Oksana Shadrina, are moving into franchising the brand across the MEA region. Bringing their handcrafted flavours to the Middle East through an un-traditional approach to franchising, the pair have a truly spectacular vision, as MEA Markets Magazine is excited to explore. Drawing on Miceál’s heritage, Fantastic Flavours Ice Cream Parlour combines the American-diner style of décor with handmade, artisan ice cream made fresh on-site daily, to create an innovative space for those seeking gourmet ice cream served in a friendly setting. Through his military and government service, and working as a legal mediator, Miceál has vast experience travelling the world and working in multi-cultural environments. Along the way he has gained an appreciation for great service and an understanding of true quality. When he and his wife decided to create a new business, they were both keen to use the skills he has gained over the years in a new, unique setting, and bring something truly unheard of in his adopted home in Ireland. The Emerald Island (as Ireland is called), unlike others such as Italy, the United States and the UK, never developed a culture dedicated to producing and consuming real, handmade ice cream. Owing to various factors, including rationing, reduced labour and general hardship, during the Second World War, what industry there was died out. This is why Fantastic Flavours dedication to artisan quality and handmade ice cream was a revolutionary new concept for Ireland when they opened their doors in 2013. Miceál, who, alongside his wife Oksana, felt the time was right to create a parlour dedicated to fresh ice cream, which comes in innovative flavours to suit every palate. now expanding into another region that is not world-renowned for its gourmet ice cream production: The Middle East and Africa. The idea for this latest venture came about as a result of the pair’s extensive travel throughout both the Middle East and Africa. Having sampled many dishes during their travels and met many fascinating people, Miceál and Oksana decided that they would like to incorporate the diverse range of cultures and cuisines that they experienced into their ice creams. Rather than simply bringing a taste of the Middle East back to their Youghal shop, they are keen to move into the region and create a franchise like no other before it. Whilst many ice cream franchises traditionally sell mass-produced ice cream that is simply shipped to their store to be served by the franchisee, Fantastic Flavours franchises will see each shop make its own ice cream, on-site, daily, using the same time-honoured, artisanal techniques that made the original parlour world-famous. With years of experience training others how to make ice cream in their own Ice Cream Academy, they know what works and what doesn’t. The Fantastic Flavours franchise difference is based on creating the ‘local artisan café’ experience with all the benefits, brand recognition, quality control, training and support franchises provide. Fantastic Flavours franchises did not grow from nothing, but from the aim to ensure that customers everywhere have access to artisan food the quality of which is un-matched. This will remain central to the franchise, and the Founders are committed to working closely with their franchisees over the coming years to ensure that each location achieves the quality and success for which the Fantastic Flavours brand is renowned. A key selling point of the brand is its delicious ice cream is produced using time-honoured recipes which incorporate local ingredients wherever possible. Therefore, Fantastic Flavours franchises will support the local economy by creating jobs and sourcing local ingredients from suppliers within their region wherever possible. At the same time, franchises will also ensure that the products it sells are priced appropriately for the region, making luxury ice cream accessible to everyone. By not having to purchase bulk inventory from central warehouses and producing the ice cream on-site using local ingredients, franchisees will escape tying-up their money with expensive inventory and properties with large freezer storage-rooms and can instead focus on the customer experience which drives cashflow. These values are the same as those by which Miceál and Oksana created their original shop over six years ago. Franchises will also work towards the same Fantastic Flavours mission: to create and serve handmade, artisan ice cream with excellent customer service in a unique and pleasing setting. 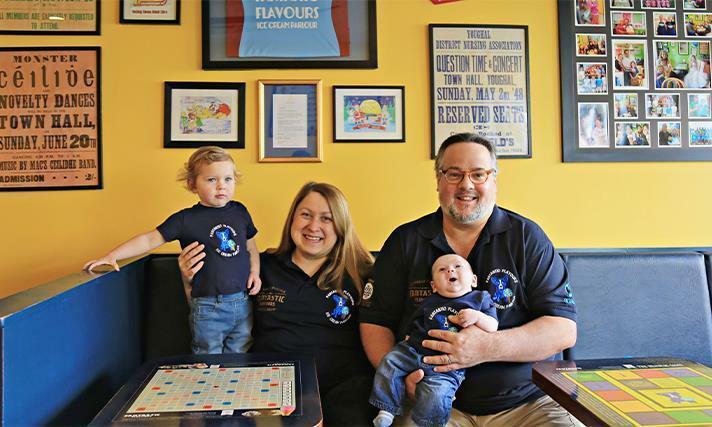 By sticking to the basics and focusing on food and service, Miceál and Oksana are sure that success will follow for their franchises, and they are excited to support them in this exhilarating journey. but revolution in making artisan quality ice cream available, farand-wide. Continuing to focus on the quality ice cream, the pair are also eager to grow their offering, and are currently seeking to expand their food offerings beyond the pizza, crepes, desserts and gourmet coffees they now offer. Market research indicate this creative approach to growth will help ensure that visitors to Fantastic Flavours franchises, in the MEA region and beyond, will enjoy the same success as the original shop in Ireland. At the same time, franchisees can enjoy a business that is built on the tripod of exquisite ice cream, food and drinks. All of these values will remain the Fantastic Flavour’s raison d’être as the brand enters the MEA market and an exciting new chapter for the business.